Hi everyone, today I'm here with a card inspired by a post I made on my Instagram account for the 30 Day Colouring Challenge hosted by Kathy Racoosin and it featured the little gingerbread men from the Oh Snap set by Lawn Fawn (I'll post a photo below) and I'm also going to be using the Zig Clean Colour Real Brush Pens for some water colouring. This is the card I made for today. So to begin my card today I pulled out some Tim Holtz Watercolour Cardstock and treated both pieces with an Anti-static Powder Bag. 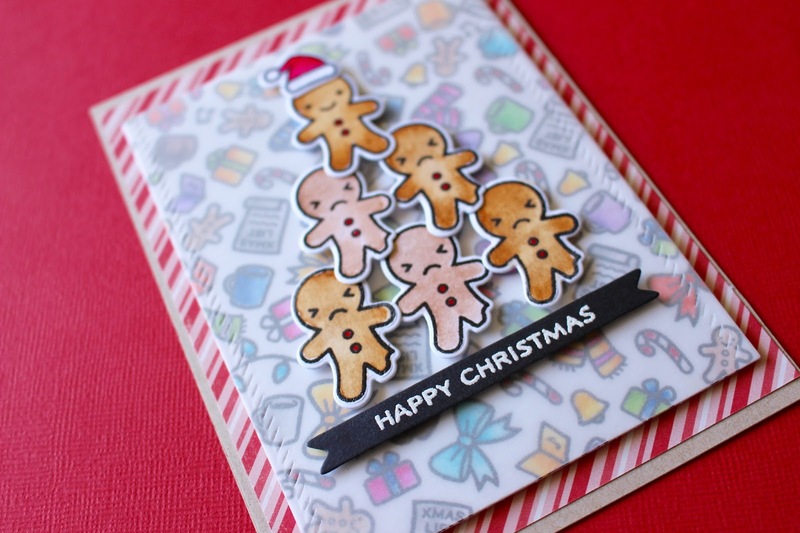 I then began stamping out my background and gingerbread men. All three sets are from Lawn Fawn - Baaah Humbug, Oh Snap and Holiday Party Animal. I used some Versafine Onyx Black ink to stamp out all my images today because I'm going to be doing some water colouring and this is an ink I can clear emboss over top and I like that just so I can keep my water colour contained. Once they were all stamped out I coated the pieces with Clear Embossing Powder and then melted the powder with my heat tool. I then decided to colour in all my images with my Zig Clean Colour Real Brush Pens and the best way I've found to use these pens personally is to use a damp regular paint brush to move the colour, to move fast and to work in sections. With smaller images it seems to be okay but it still works better to work in little bits and pieces on each image as then the colour won't try and the colour will move easily. So anyway, that is just my personal opinion to how to use these markers for watercoloring and the best way I have found for me. Now, back to the card. 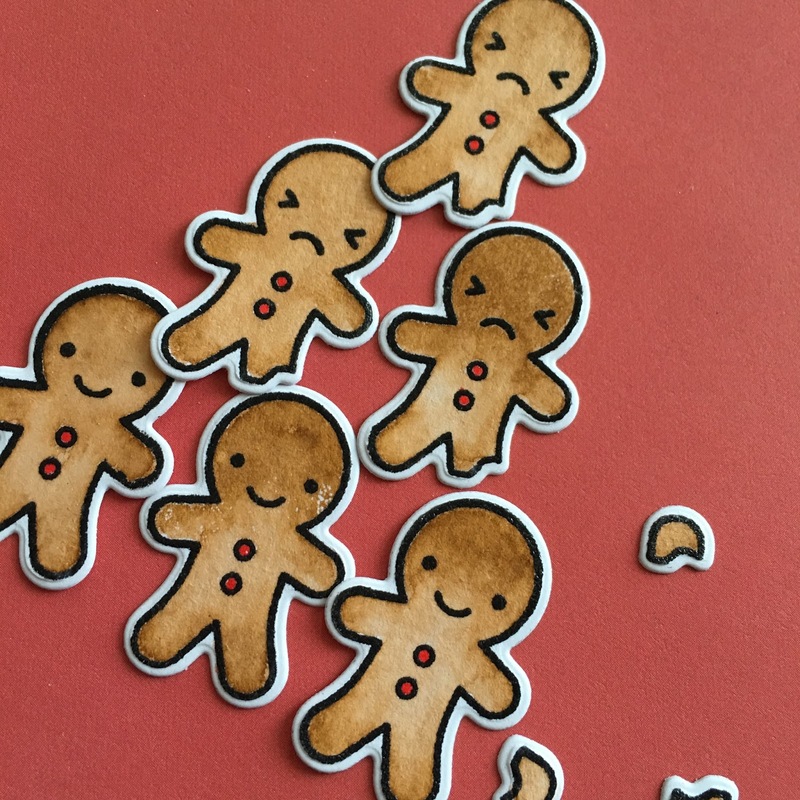 Once I finished colouring in all these images I used the coordinating dies for the gingerbread men to cut them all out and then also the hat. I then used the smaller frame from the Sew Fancy set by Mama Elephant to cut out the background piece. I then took some vellum from Bazzill to cut out the same frame so I could cover my background piece to dull down all the colour and so I could let the gingerbread men shine. Now it's time to adhere all the pieces together. 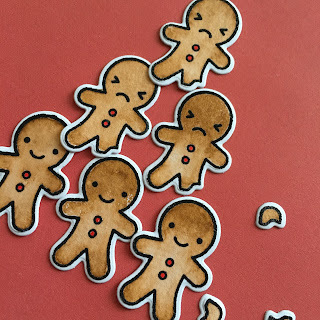 For the inspiration on the gingerbread men, as I said before it was inspired by a post I made on Instagram - so here is the picture I posted for the colouring challenge. 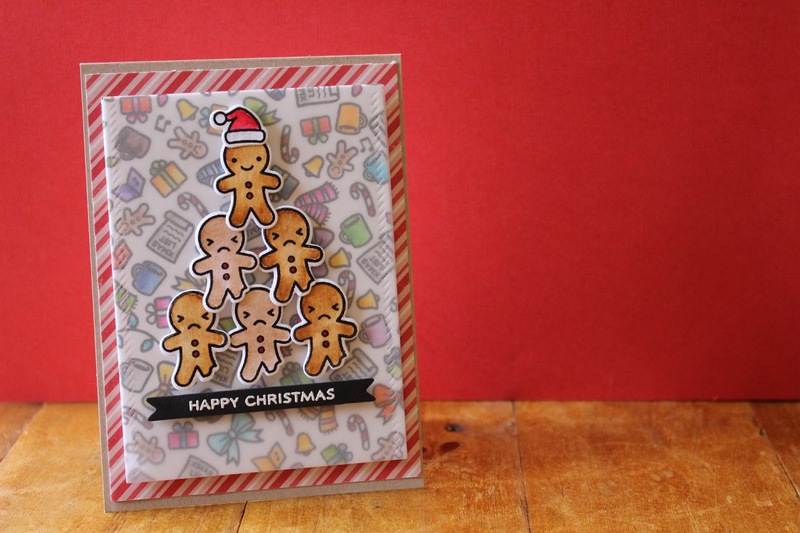 I loved the look of the ginger bread men stacked like a pyramid so I knew I wanted to create a card with that look. So to adhere all these pieces together I started off with adhering down all the gingerbread men with foam adhesive to just the vellum piece. Then I adhered the vellum piece so I could strategically place the runner adhesive behind the gingerbread pyramid. I really like how this looks with the dulled down colourful background at the back. I then pulled a piece of patterned paper by October Afternoon's Silent Night collected and just cut that down a little smaller than my card base - which is Neenah Desert Storm Cardstock and adhered that flat down onto my card. I then used foam adhesive to adhere down the main panel on top of that patterned paper. For the senitment I used the 'Happy Christmas' sentiment from the Oh Snap set by Lawn Fawn and I cut off the brackets on that stamp since I know I'll never use it with the brackets on. I stamped that down onto some Black Cardstock and white heat embossed it. I used an old die by Studio Calico that came out of an old card kit to cut out my sentiment into a banner shape. I then adhered that onto my card under the ginegrread men also with some foam adhesive. For a final touch I used my Clear Wink of Stella pen to add some glitter to the Santa hat and that finished up the card for today. Thanks for stopping by today, I hope you enjoyed the card and got inspired. I'll be back soon with Day Eleven.